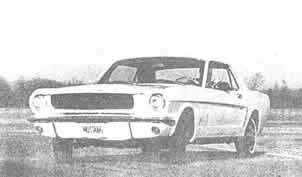 If Ford Motor Co. had had the foresight to build the Mustang in Europe, with its new-for-1965 200-cu. in. Six, the car would have been hailed by automotive enthusiasts everywhere as an example of exceptional engineering and, perhaps, even as A Real Sports Car. After all, the "secretary's sports car," as the "basic Mustang has come to be known, has perfectly acceptable performance for Europe. Its 90 mph top speed is respectable enough, its engine, had it come from Europe, would be viewed as a marvel of engineering ingenuity, and to have an automatic transmission hooked to such a huge powerplant would be hailed as the utmost in luxury. Moreover, it easily outruns Volkswagens and assorted cars of similar ilk, its handling and maneuvering is sprightly enough, it cradles one in American comfort and relatively embarrassing richness, and it can brag about tough and tenacious relatives while disdaining itself any appearances in the competitive pits and paddocks. So it is that, in getting acquainted with this Stewardess' Six-Pack, we see the engine as an -interesting development, if not a marvel of engineering achievement. The 200-cu. in. Six is a thorough redesign of the earlier block which had been in use since the 1960 models. It's the largest of the 144 (now discontinued) 170-200-cu. in. family of engines, with an oversquare, 3.68 x 3.13-in. bore and stroke. Engineers have laid in three additional webs for the main bearings and redesigned the crankshaft to ride in them, thereby bringing the engine up to snuff in an era of 7-main bearing 6-cyl. designs. Strength and stamina thus assured, attention was then turned briefly to the upper end. In the cylinder head, it was found that valves of 1.62 and 1.36 in. could be accommodated without strain, representing enlargement from 1.52 and 1.27 in. intakes and exhausts, respectively. Camshaft timing was altered, too, the new sequence of 7-65-55-21 being on the wilder side, though hardly enough to notice. Compression ratio was increased from 8.7 to 9.2:1. The resultant 4-bhp increase still peaks out at 4400 rpm and the torque peak of 190 Ib.-ft. — up from 174 — still comes at 2400 rpm. The significant cost of this work is an additional 15 Ib., for a total engine weight of 380 Ib. One of the benefits of the 7-bearing design is increased engine smoothness, though modem vibration dampers and other design considerations seldom let the older 4-main engines seem particularly obtrusive. There's no doubt that this revamped Six is smooth, but it wasn't something measurable. In fact, because of carburetor bothers which never really were sorted out during the time of the test, this particular example had an annoying shake problem at idle. It is in the carburetion that fiddling would be most desirable. This engine has a single throat Zenith of 1.437 in. venturi diameter, somewhat hopelessly overwhelmed by all that increased valve area and hardly capable of supplying the demand of those pumping 3.68-i'n. pistons at full greed, In normal trim, -with air cleaner and mufflers in place, the engine drew the line against further effort at about 4000 rpm. It is unfortunate that most emphasis in bolt-on power accessories nowadays is on V-8 engines because Sixes such as this would be such practical and pleasing subjects for a bit of attention. While there would be nothing remotely complicated about multi-barrel manifolding, which is just what this engine cries out for, the preferred methods seem to be to simply pop in a big V-8 engine rather than bother with Six. The Mustang is a perfect example of the problems which crop up with such substitution. When the next larger engine, the 289-cu. in./200-bhp V-8, is ordered, there's an immediate jump in front-end weight by some 100 Ib. Then, power steering is certainly desirable, so that adds another 50 Ib. When the \f-8 is installed, the car is automatically equipped with heavier front suspension components, larger tires, wheels, brakes, rear axle and lesser related components. So there is a net gain of 300 Ib. involved, then, in adding 80 bhp (some of which is siphoned off by the power-steering pump anyway) because of the substitution of largely Fairlane-based running gear for previously used Falcon-based components. It wouldn't take much in the way of carburetion work and camshaft timing to equal the power/ weight improvement with the lighter basic car. Still, demand for V-8 Mustangs is running at about 80% of production (at $100-some premium in base price), so the more popular route obviously is via bigger engines. But there is another penalty involved, the deteriorating front/rear weight distribution from that originally designed. Now all Mustangs (save, perhaps, those getting sohc 427-cu. in. engines) are capable of good handling. This is particularly true of the Six, so long as basic springing is taken into consideration; They have reasonable understeer, kept within reasonable limits. If there is one weak spot, it is rear axle tramp; more often than not some conscious effort will be necessary to compensate for the skipping around which the rear wheels develop upon abrupt unloading. Relatively speaking, however, the Six goes about its task a little better because it's 1), closer to basic design in weight distribution; and, 2) not so potent that it overpowers its rear-wheel cornering ability by brute torque. At speed, it's so easy to slip the Six into a drift while bombing along a meandering road that one soon begins to feel like an expert. Just for the record, this 2600-lb. car is sprung somewhat softly, in the modem manner, but is well controlled by its shock absorbers. Anyone wishing to reduce'the sponginess can simply install heavier-duty shocks. Off-the-shelf, however, it has a ride which certainly should please any secretary, stewardess or housefrau. About the only piece of extra-cost equipment on this particular car was the 3-speed Croise-O-Matic transmission. This was controlled by a T-handle on the floor (no console) but it seemed to have more looseness than we like in an automatic, shifting too slowly and erratically. However, when pushing the car to the limit for acceleration times, it-turned out to be smarter than our drivers. Several runs made by manually holding gears to higher rpm produced poorer times than those where shifting was automatically accomplished. The best times were recorded with the lever in the D2 spot, stuffing the. foot to the firewall and driving off the line. Much of the pleasantness of this car is the result of having the automatic with its 2.14:1 torque multiplication, thereby utilizing the somewhat limited torque of the Six to its greatest extent. Had there been some higher (numerically) final drive than the stock 3.00:1, the snappiness of the car would have been more evident. Mustang Sixes with manual transmission come with 3.20:1 rear gears, but the gear spacing with either the 3- or the 4-speed is somewhat less happy. The English Ford-adapted 4-speed has gearing of 3.16 low, 2.21 second, 1.41 third, and 1.00:1 high—far too widely spaced to be of much more than novelty value. Though it really wasn't needed, the Bendix linkage-assist power steering reduced the pull necessary on the rim to an uneasy lightness. But more important, use of the 16.0:1 gear reduced overall ratio to 21.7 and the number of wheel turns between locks to 3.73. As such, it has about the minimum quality of quickness which can be tolerated in a vehicle of this type. " Another pleasure with this particular car was the brake performance. Deceleration rates of 22 ft./sec./sec. (maximum) were consistent and above average. In fact, such performance is little worse than that of the optional disc brakes. To achieve this with the 9-in. Falcon drums is, to say the least, remarkable. Total swept area is a minimal 212 sq. in., so the credit must be given to the light overall weight and a somewhat tougher molded asbestos lining material than has been used heretofore. With overall performance judged better than average, one need have no fear of letting the girl-friend drive this car. T^all gals, by the way, find the Mustang doesn't interfere with bouffant hair-dos. 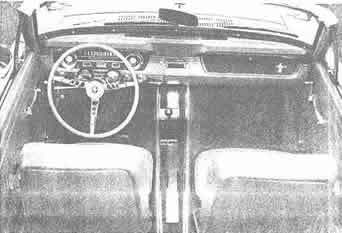 The bucket seats are quite close to the floorboards and one sits down in the car, rather than Eerching upon it. But the petite gals might just complain a it about this very thing. It's possible that a woman of diminutive stature would be staring more at looming hood than open road. There are adjustments which can be made to the seat, but seating position should be checked against personal preferences. The new "bench seat" option, which actually is a pair of the present buckets joined by an over-the-hump connection, really doesn't change the situation since most of the same mounting hardware is used. Although there are some new dress-up options for the Mustang which have their main appeal to Gal Friday, the basic bottom-of-the-line Six comes in very presentable form. Full vinyl and carpet and color-keyed interiors leave a tasteful impression on the womenfolk, as well they should. Things fit together well, but the gals may complain a bit more often about the poorly operating glove box door latch. From there, however, additional degrees of luxury are offered, including simulated wood trim all over the inside, embossed horses galloping across the seat backs, and door panels with integral arm rests and pistol-grip handles (all newly announced last spring). With all that sort of thing going for it, the verdict on the Mustang probably should be: Those doggone Yankees really have gone and built a car almost as interesting as anything the Europeans have!